Washington Post: Who Created the Most Jobs? It is no secret that the 2011 election will be won by the candidate that can convince the American people they can create the most jobs. The GOP candidates have wasted no time trying to prove their historical job creation records, but in the process many of them have bent the data to their liking. It is clear from the viz that there are vast differences in the job creation rate among the states, but no state is immune from national trends like the financial crises. Therefore, any claims about job creation rates should be taken with a grain of salt. 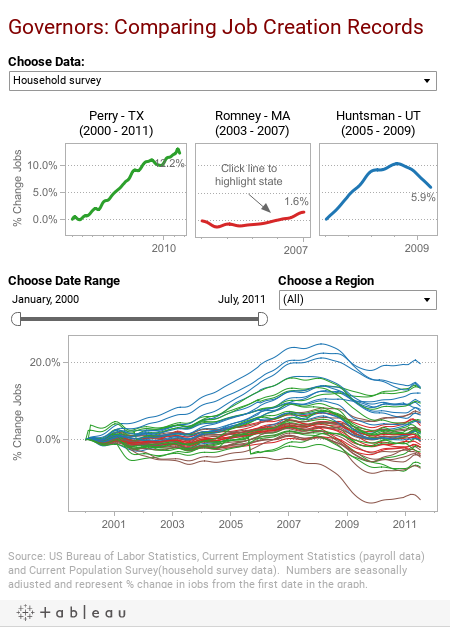 The top three charts show that Mitt Romney's record in Massachusetts is less impressive than Perry in Texas or Huntsman in Utah. Perry is the clear leader, but he was also governor much longer than Huntsman or Romney, so should his full record be taken into account? Who is the best at job creation? We are not sure it is possible to empirically say, but when you hear a candidate talk about their amazing record with employment, make sure to take a look at the data before you decide. Our own Lori Williams earned a prized Geppetto checkmark for truthfulness from Glenn for creating this viz.